I love Portugal. It has awesome weather, a beautiful coastline, rich history and great wine. Portugal not only has fantastic reds, whites and desert wines, it also has a category which is distinctly Portuguese. This is Vinho Verde, or Green Wine. Vinho Verde does not refer to the wine’s color, but the fact that it is new wine. It is mostly white, though reds also exist. The whites are a bit sparkling, fairly acidic, and are all very refreshing. They are absolutely perfect summer wines and relatively low in alcohol so you can have some with lunch and not feel like you want to fall asleep in the afternoon. The last Vinho Verde I tasted was a perfect example of this category. 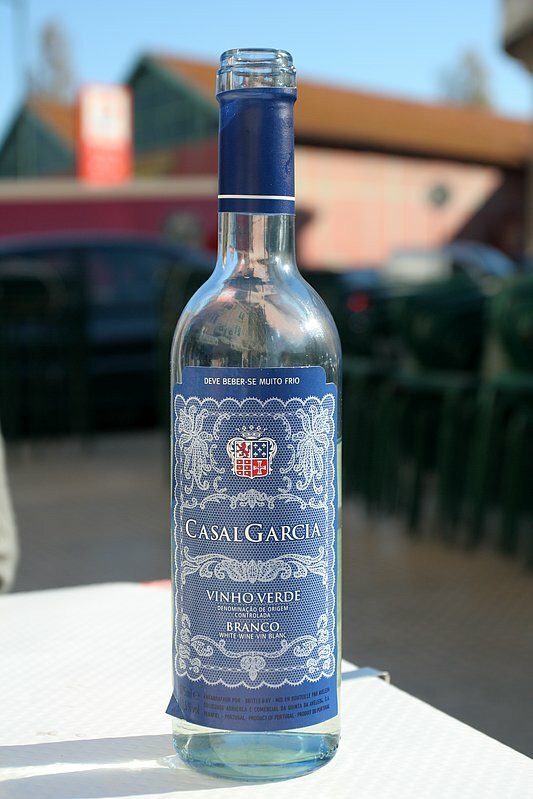 Casal Garcia is from the house Quinta da Aveleda, which is the largest producer of Vinho Verde in Portugal. They make about 1 million cases of wine a year! What I admire about them is that even at this huge production they make consistently good quality wines. The Casal Garcia is made from four grapes: Trajadura, Loureiro, Arinto and Azal. This simple wine has quite a bit of citrus and apple (granny smith) and a load of fresh taste. I had it with fresh seafood in Lisbon on a sunny afternoon. I would not have chosen any other wine for the occasion. And it was the house wine. Spain, are you listening?